Happy Holidays From Midwest Motors in Eureka, MO! Here at Midwest Motors, we wanted to send our friends, customers, and contacts some great holiday deals, tips and tricks for winter driving, and some great gift ideas! With 2018 just over the horizon, we thought we would say thank you for considering Midwest Motors. We want to make sure all of our customers, family, and friends stay as safe and warm as possible this winter. And as a valued customer, we thought it might be nice to include some cold weather tips for keeping safe on the road. 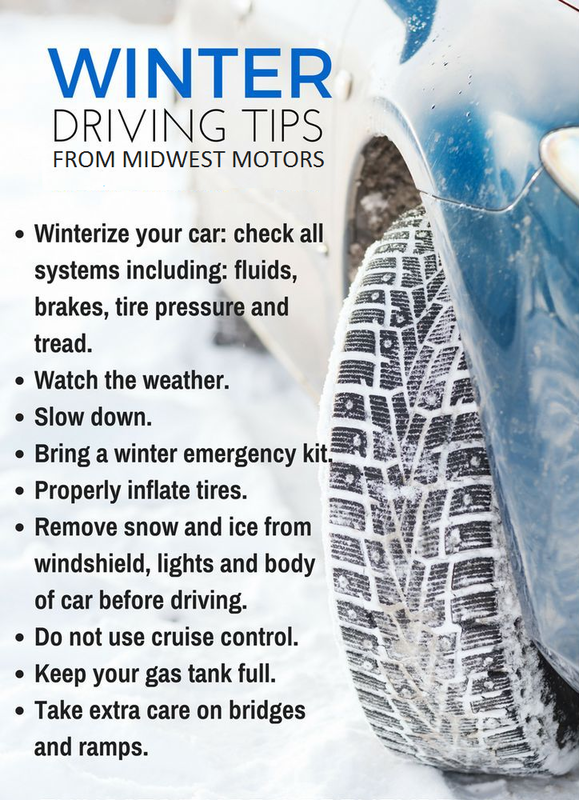 Whether you're wanting to get some winter wipers, new tires, maintenance like an oil change or transmission service, or need some safer tires for the snowy weather ahead – Midwest Motors is here for you! We work directly with tire warehouses, so we can save you money and install new, safer tires on your car, truck, van, or SUV so that you can keep you and your precious cargo safe this holiday season. One more tip: It's always a good idea to keep a warm blanket in your trunk, just in case you get caught in really bad traffic or your vehicle gets stuck! Kids going back to college in January? Make sure they have tires on their car equipped for the long road ahead. We are currently offering HALF OFF our Road Force Balance tire balancing services with the purchase and install of four new tires! You could save up to $67.50! Just mention that you received this email and we will take half off the Road Force Balance! We can order and install most tire brands in the SAME DAY, so you don't have to wait a week for us to get it in stock. We know this is a busy season and there's a lot to do – so we're happy to help you save time! We're looking forward to serving you and seeing you in 2018!